click on the champion you want to see or page down to see all our National Champions. 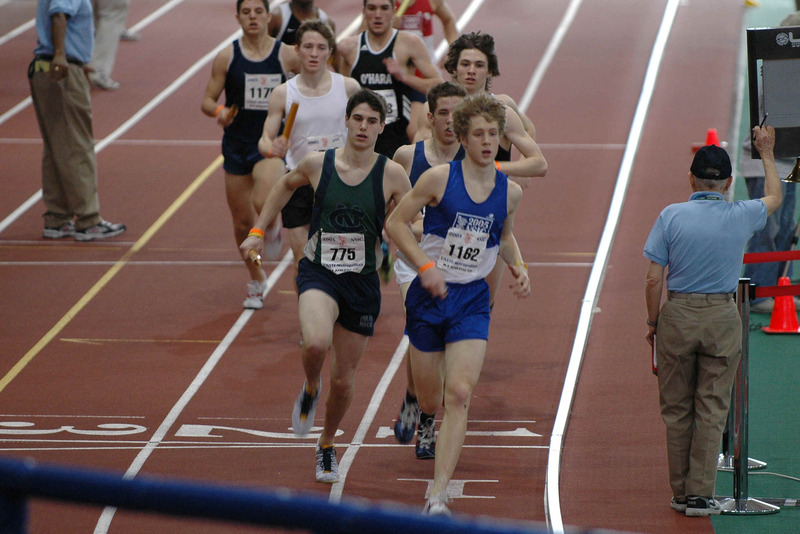 When Craig Forys broke his leg in the Cross Country Meet of Champions in the fall and had to take 6 weeks off from running, the winter track championship relay season was in doubt. 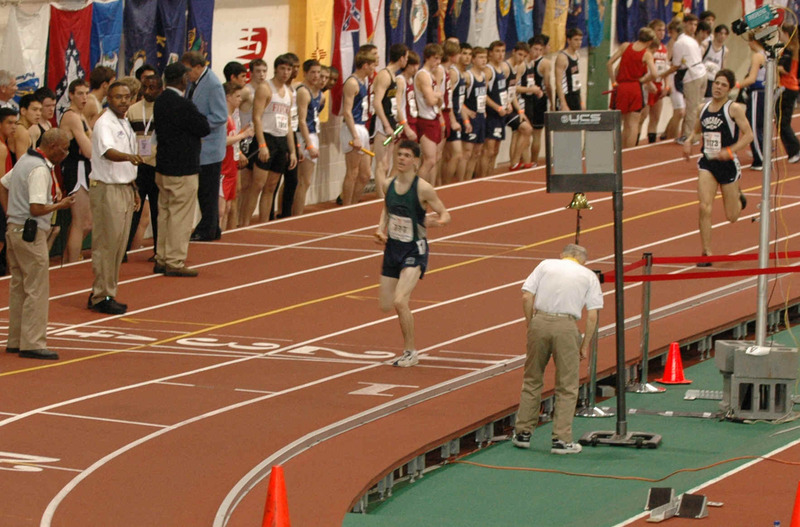 It started to turn around when the 4 x 800m relay ran 7:51.21, the #3 time in the US on 2/19. 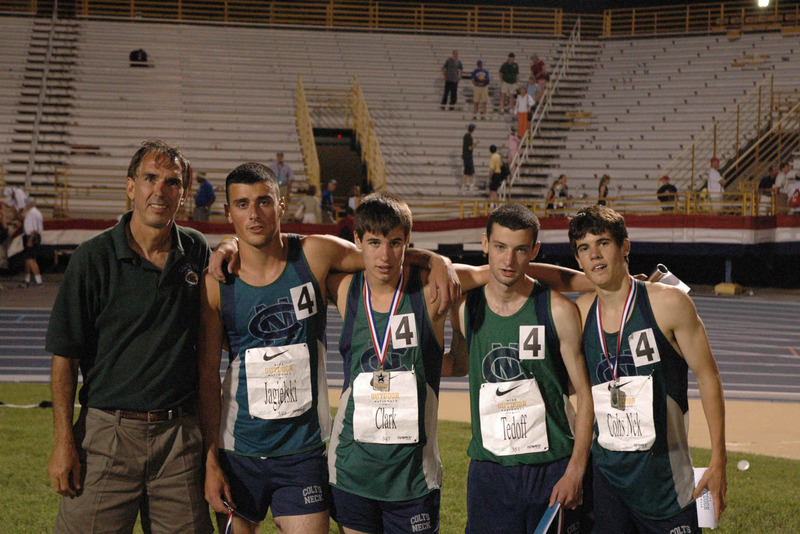 The team, minus CJ Clark, then ran 10:15.08, the fastest time in the US, to win the Eastern States Championship. This set up the team as the #1 seed in the Nationals. Zach Tedoff put the team in great position by out kicking the NY State 1600m champion Carlos Jamison to hand off in 2nd after the 1200m leg; CJ Clark, running the 400m leg, closed the gap and then passed the leader in the final stretch to give CN a little over a second lead; Ryan Jagielski lost the lead in the final turn and then stormed back in the last 40 meters to hand off even with CBA after the 800m leg. 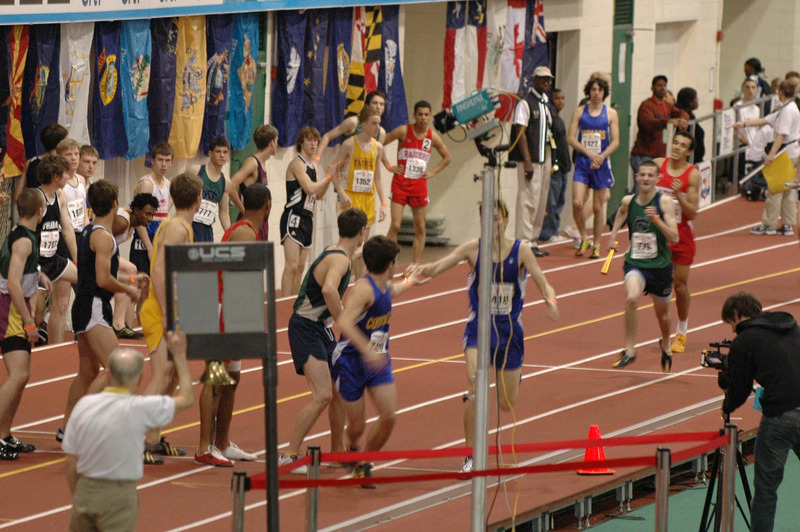 CN was now 6 secs faster than the Easterns when they had missed the State record by just 3 secs. The record was in reach but then the race turned tactical. 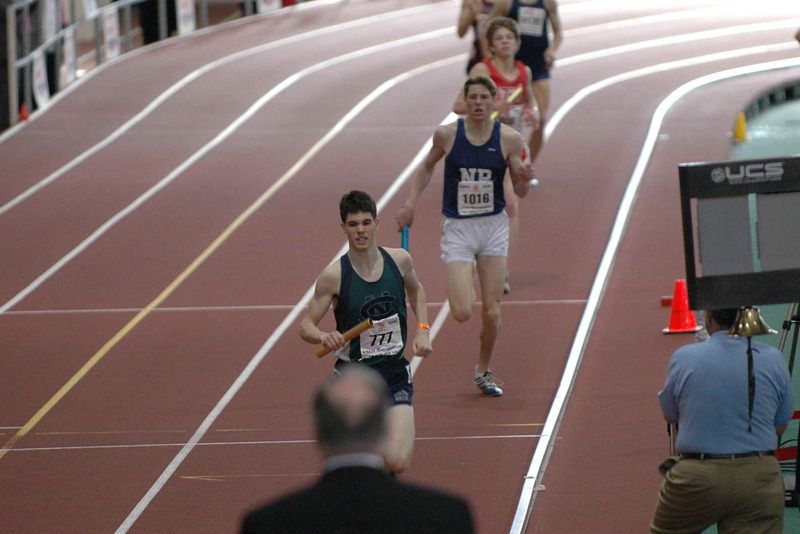 The CBA anchor leg moved over to lane two to make Craig Forys lead. Craig took the lead but kept it slow so he wouldn't be stuck doing all the work just to be out kicked. With three laps to go he picked up the pace. He surged again with 2 laps to go and then again with a lap to go which finally broke the CBA anchor. 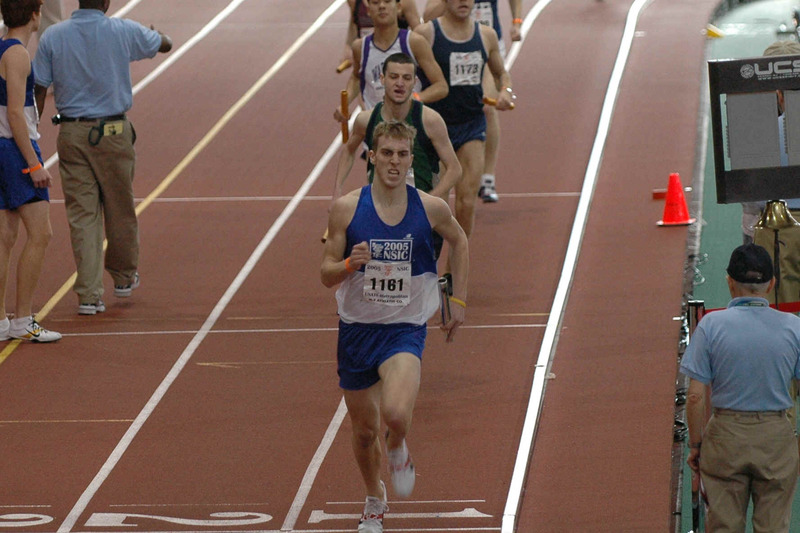 Craig would finish the last 400 in 59 secs to anchor CN's first National Championship. 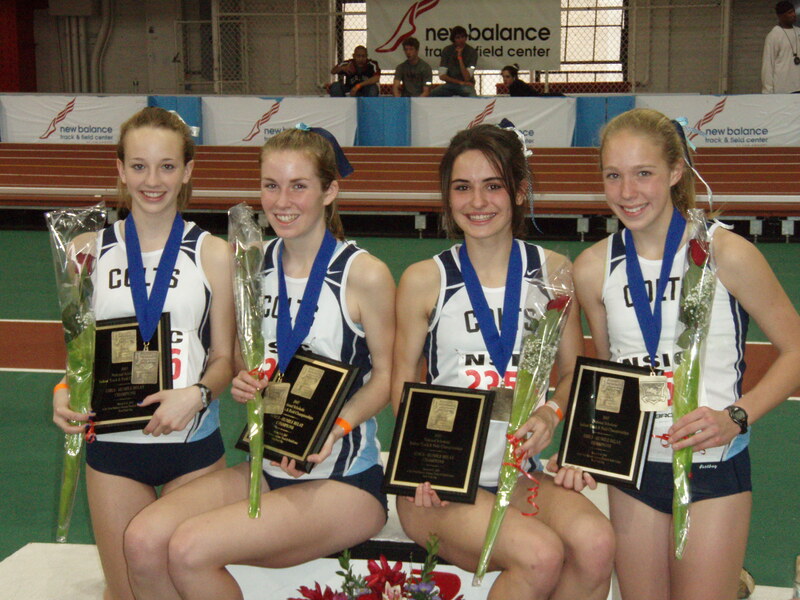 The same foursome would come back two days later to finish 2nd in the 4 x 800 meter relay with a new Shore Conference record and NJ's 2nd fastest time ever. See below. 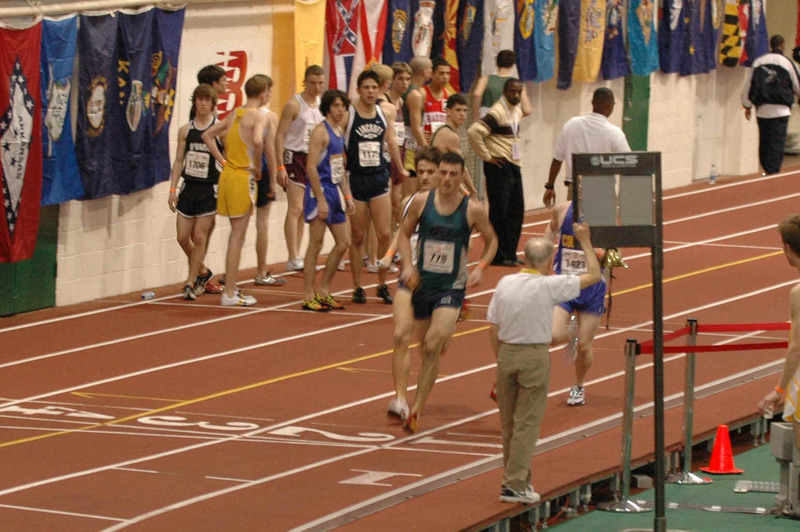 Zach Tedoff about to hand off in 2nd after the 1200m leg. 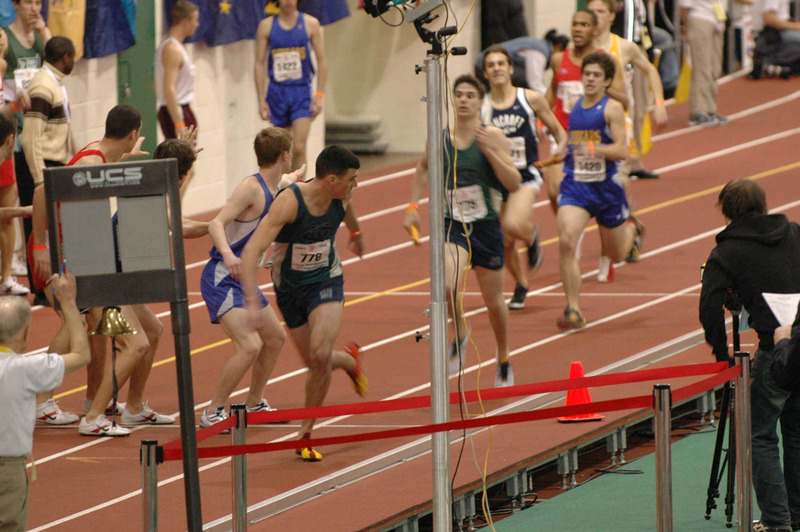 CJ Clark hands off to Ryan after moving team into 1st place during the 400 leg. Ryan Jagielski leading with CBA and Cranford chasing. Craig pulls away from Greg Leach of CBA in the last lap to win. CJ Clark in 2nd leads off and would hand off in 4th. Zach Tedoff runs the 2nd leg and would hand off in 2nd place. 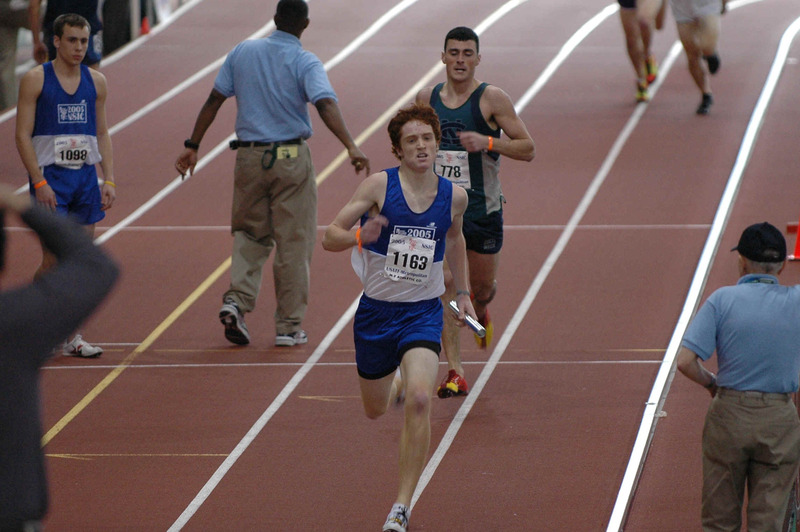 Ryan Jagielski chases after Shaker HS, the 3rd fastest team in US history in 2nd. Craig finshes 2nd, just ahead of North Penn, PA..
With the four girls personal bests adding up to a time faster than the NJ State record, this race had become a focal point of the season for the girls. They knew they also had a shot at winning the race. Kristen O'Dowd got it started handing off in 4th place with a new personal best; Allison Linnell held 4th for the whole race as she was within 3.5 secs of her best; Briana Jackucewicz went out smart and gradually moved into the lead as she then handed Ashley a huge 7 sec lead; Ashley had last year's champions, Clarkstown HS (Running Gear) led by sub 4:50 miler Stephanie Morgan and Footlocker National Cross Country Champion Aislinn Ryan chasing her. She ran a personal best to actually extend the lead by a second and finish in a new NJ State record, beating the old record by Red Bank of 20:46.30 that featured the Trotter twins. All four girls were underclassman. 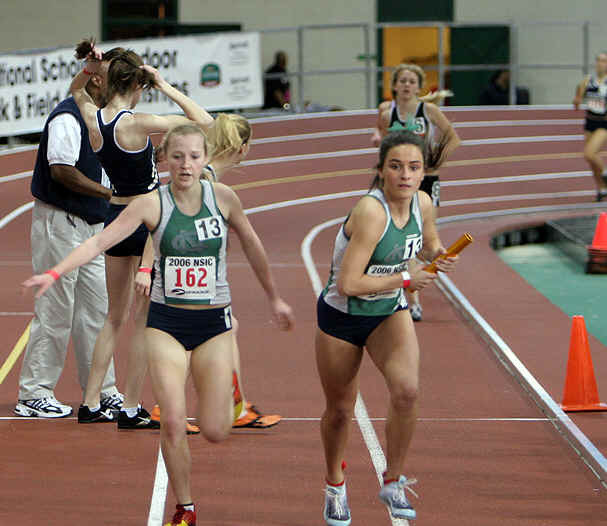 During the 2nd leg of the relay, Allison Linnell stalks behind in 4th place. She would hold the 4th place that Kristen had given her. Briana Jackucewicz takes the lead from Jenna Leach of Clarkstown HS, MI. Ashley Higginson gets the baton to start the anchor leg of the relay. Briana has given her a 7 sec lead which Ashley will stretch to 8 secs. 2nd place is still on the turn. 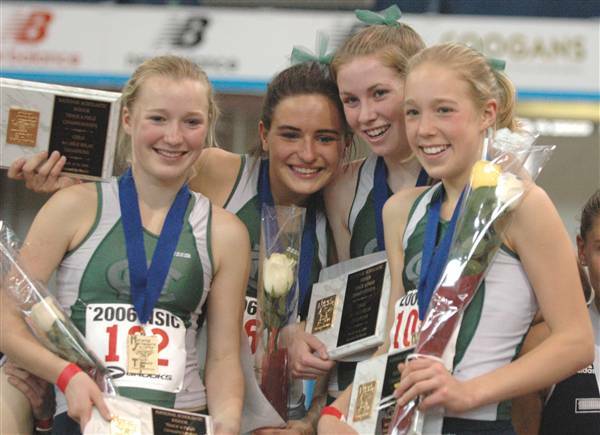 The dyestat story: Colts Neck NJ was missing one of its stars Briana Jackucewicz because of a sore hip, but this did not stop them from defending their national title. The other three girls from last year’s winning squad were all here, supplemented by Allie Flott on the leadoff. Flott took it out in 5:15.0, handing off in fifth place as Shenendehowa NY opened a gap on the rest of the field, leading off in 5:08.4. 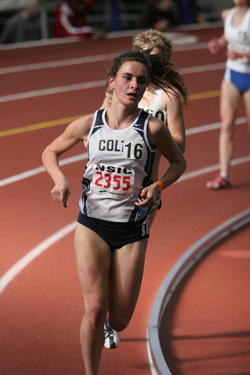 Allison Linnell then quickly moved up to second and slowly closed the gap on Shen, splitting a 5:15.3. Kristen O’Dowd got the stick about five seconds behind Shenendehowa’s third leg, but that deficit was melting faster than any remaining snow on the cliffs of the Palisades across the bridge, and with about 300 meters left O’Dowd went into the lead. When Ashley Higginson started her anchor leg with a few meters’ lead on the field, it was all over. She flew through her eight laps (and a little more, since it was a full mile) in a stunning 4:48.6, nearly lapping the Shen anchor who started right behind her. Their winning time of 20:36.41 was two seconds faster than last year and 9th in US history. 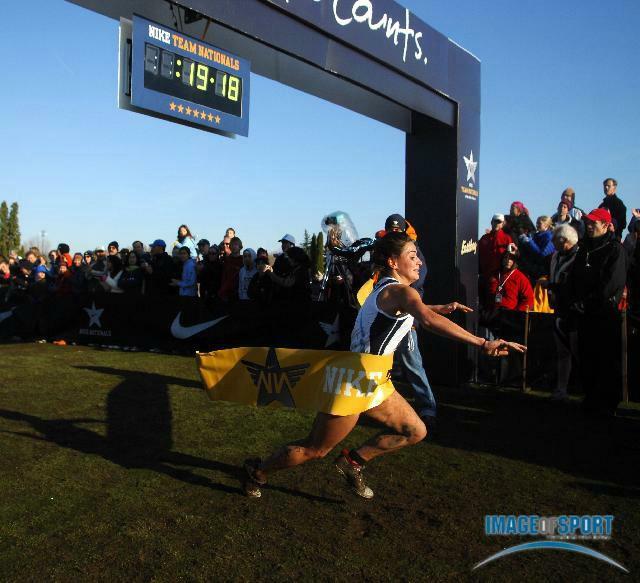 An extremely muddy course and cold weather (low 40s) met the athletes for the 3rd Nike Team Nationals. As the gun when off, Allison Sawyer of the defending champion Hilton HS, NY team took the lead and opened up a 40 yd lead by halfway. Ashley was hanging back in 2nd place leading the chase pack until defending champ Betsy Bies of Yankton HS, SD moved by her into 2nd. With about 1000m to go, Betsy surged to the lead as Allison lost her shoe. About 300m later Ashley surged by Betsy to take the lead. From there, it was Ashley fighting exhausted legs from fighting the deep mud in most parts of the course. 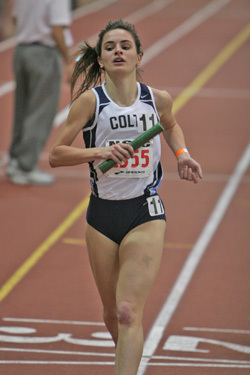 (see pictures on coltsneck website below results) As Ashley hit the finish line her long 1" spikes grabbed the ground and sent her face first into the ground as Alan Webb, the American 1500m record holder who was holding the finish tape, looked on in amazement. It was a gutty performance which led the team to a 4th place finish against the country's elite high school programs. She would race in San Diego, CA in the Footlocker National Champs the following Saturday but a cold and the 3rd cross country flight in a week would take it's toll and she would finish 22nd. Ashley early in the race in 2nd as she chases the early leader Allison Sawyer. Ashley leading defending champ Betsy Bies with about 200m to go. Dyestat story: Ashley Higginson is the kind of a runner who gets tired two days after a race instead of the day after. So it was fortunate that her 4:48.9 on the 4x1 mile relay anchor did not come on Friday, or we might not have seen the Colts Neck NJ senior’s spectacular display of front-running, even pacing, and relentless drive that brought her an individual national crown today. 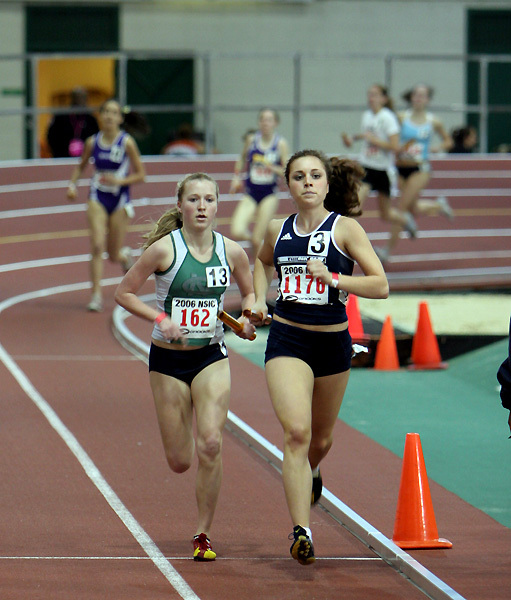 Higginson went to the lead right from the gun, pulling a string of several other contenders behind her, including Emily Jones MA, Allison Sawyer NY, Shelby Greany NY, and the national 5000m champion from Friday, Marissa Treece MI. 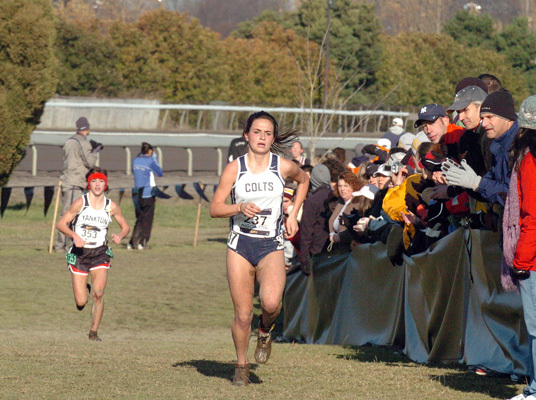 As Higginson kept running 38- and 39-second laps, the parade behind her slowly began to thin out. At the mile mark, reached in 5:09.7, only Treece and Jones were with her, and one lap later it became a two-woman race with Jones losing distance. But Treece determinedly hung onto the Jersey harrier even as the leader gradually began to pick up the pace. When Higginson really dropped the hammer with 400 meters to go, however, she assured herself the victory. Blazing the last quarter mile in 73 seconds, Higginson won in 10:16.75, a US#1 this winter and a New Jersey state record. Treece hung onto second with a US#2 time of 10:22.96. Ashley’s 220 yard splits were as follows: 38.6, 38.3 (1:16.9), 38.0 (1:54.9), 38.5 (2:33.4), 38.4 (3:11.8), 39.4 (3:51.2), 39.2 (4:30.4), 39.3 (5:09.7), 39.4 (5:49.1), 39.9 (6:29.0), 39.6 (7:08.6), 38.9 (7:47.5), 38.2 (8:25.7), 37.9 (9:03.6), 36.7 (9:40.3), 36.4. Elated with the victory, the future Princeton Tiger said that breaking the state record was her lofty goal at the beginning of the season, although she was not sure she could get it. 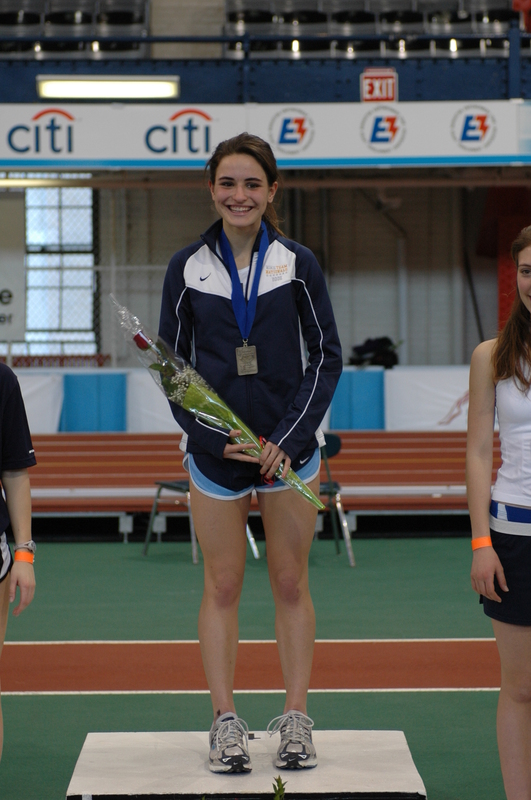 In fact, she improved her converted 3200m personal best by an astonishing 13 seconds with today’s performance. She admitted that despite feeling a little bit of pressure as the favorite, this was one of the best races of her career so far, but she also hoped that her perfect race is still to come in the future. Asked about her even pacing, she said she does not like to go out too fast and prefers to run evenly because it feels easier, especially in the middle part, when it is difficult to concentrate and not slow down. Higginson attributed her negative splits at the end to the fact that Coach Jim Schlentz trains her team to always finish strong. As for the outdoor season, her main goal was to break 10:20, but that might have to be readjusted now. She added that she just wants to prove to herself she can keep improving in the spring as she did in the fall and winter. The next time we will see Ashley racing against the nation’s best will be most likely at the Penn Relays 3000m, where she intends to defend her title. Dyestat story: Craig Forys finally won the big one. Forys, a Michigan recruit from Howell Township, N.J., was the runner up here last year. 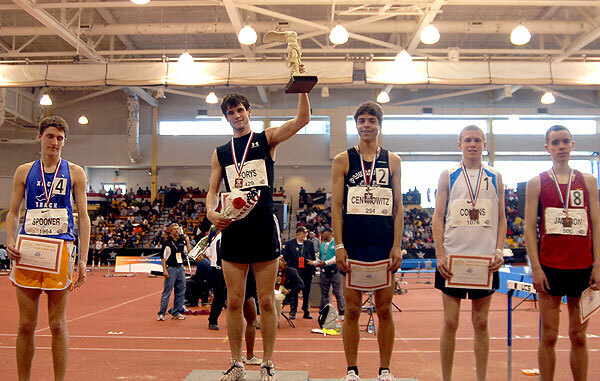 And Matt Centrowitz (Arnold, Md.) beat him at last year's Penn Relays. Forys was beginning to look like a candidate for the Washington Generals, perennial bridesmaids to the Harlem Globetrotters. Until Sunday, that is, when Forys finished second in this event in 9:01.57. “Finally!” he said, triumphantly raising his arms over his head in celebration. Centrowitz, Forys's long-time rival, moved into the lead for the first time with a lap and a half to go. But on the backstretch of the bell lap, it was Craig's turn to move into first. 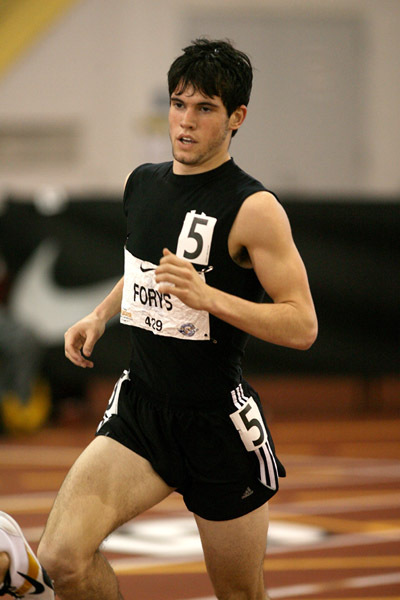 The pair raced down the homestretch to ear-splitting tumult, with Forys finally shedding his status as an also-ran. Luke Puskedra (Ogden, Utah) was third in 9:07.50. “I've got the win,” said Forys, a senior at Colts Neck High School in New Jersey. “I've gotten second enough times. The biggest release is to get this off my back. Now, if I die or anything, I don't have to worry about winning.” Forys and Centrowitz both have running in their blood. Matt Centrowitz's father, also named Matt, was a 1976 Olympian and the 1979 Pan Am Games gold medalist at 5,000m. 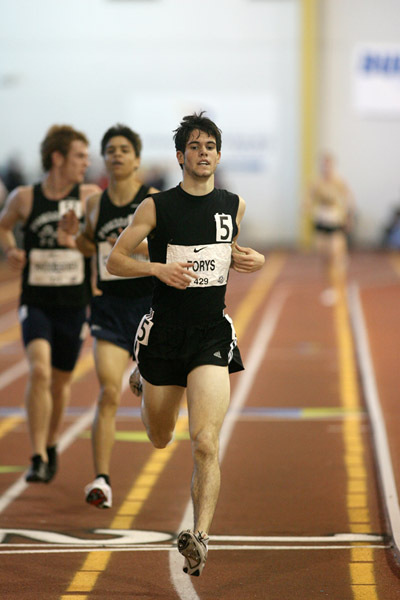 Forys's brother Matt was the IC4A 3,000m champion last week in Boston. Craig Forys mid-race. Craig at the finish with Matt Centrowitz right behind in 2nd. Dyestat story: As for Higginson, her calling card as she’s become one of the nation’s best distance runners hasn’t really been a devastating closing kick, but that’s exactly what she delivered Friday night. In fact, it was pretty similar to what Centrowitz did to Forys minutes later, though Ashley surely would have liked those results reversed for her teammate. But for her progress, the Colts Neck sr, NSIC 2-mile, and NTN champ must surely be thankful for all of 800s and 1600s she got her coach to let her run all season. But it was probably Ashley’s mental growth as an athlete that enabled her to make it through a strange race Saturday night. While this wasn’t one of the most super talented NON girls 2M fields ever, there was certainly the potential for something like a 10:12, which might have included at least a 5:05 opener. Higginson’s namesake and NIN 2-mile champ Ashley Brasovan took the lead right away with a 75.8 opener, but after they went by in 2:33, the pace went surprisingly downhill. A 79 took them to 3:52.7, then it was 79.2 (5:11.9), 80.3 (6:32.2), and 81.6 (7:53.8). Fans waited for Brasovan to launch the same kind of long, withering drive that won her NIN, but it never came. Meanwhile, she had Higginson, Neely Spence PA, Emily Sisson NE, and Kristin McGlynn CO for company and no one would take command. But finally their patience wore out and they passed 880 to go four abreast. It was Spence, with 4:50 speed of her own, who really surged to break it open and with 660 left, the race was really on – with Higginson closely in tow. They ran the penultimate lap in 72-high, and Spence kept pushing. It was too long and too hard, though, and Higginson began closing with 200 to go. Her last half lap of 35 brought her home in a very solid (considering the early pace) 10:17.44, with Spence coming through in a big PR 10:20.05. Mary Kate Champagne NY was an impressive 3rd 10:25.79, Brasovan 4th 10:27.09, McGlynn 10:28.11 5th, and 5k runner-up Lara Crofford PA 6th 10:28.67.